On February 23rd, 2017 the Parent Diversity Advisory Council (PDAC) held a meeting with representatives from various district parent organizations to learn about their role and efforts made to collaborate and share information. 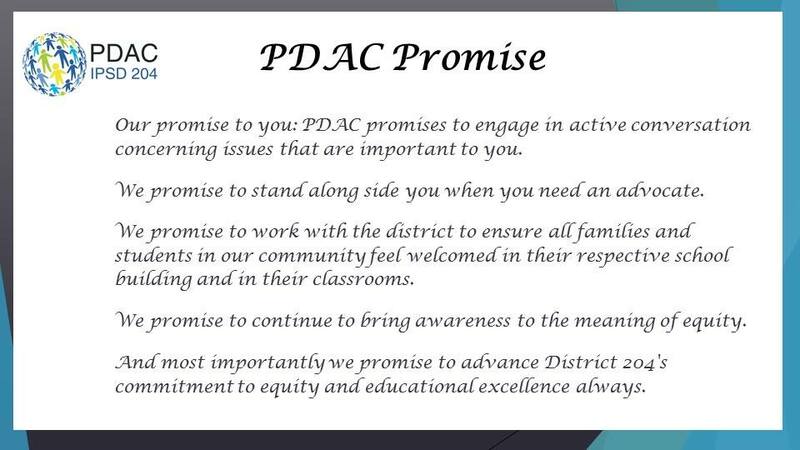 Discussion on how we continue to advocate for all students and promote inclusivity were also central topics throughout the meeting.For information about PDAC or PDAC meetings, please visit the PDAC subpage. The Parent Diversity Advisory Council (PDAC) in conjunction with the Metea Valley High School PDAC committee, invite you to attend a FREE screening of the film: Most Likely to Succeed. An acclaimed film offering an inspiring look at what students and teachers are doing in schools. The screening will take place on Friday, March 10th, 6:30 pm, at Metea Valley High School (auditorium). For additional information and to RSVP, please visit THIS LINK. On Thursday, January 19th, 2017, the Parent Diversity Advisory Council (PDAC) hosted a meeting titled: How Can We Help All Students Achieve? The Psychology of Success: Ability Versus Accomplishment. An informative video about Schools of the Future and growth mindset was shared. Some of the highlights of the video included scientists’ research of studying brain development, addressing poverty and how socio-economic status impacts inequity. A rich discussion about our Future Ready work followed with information about technology and the importance of SEL (social-emotional learning) for students. The meeting presentation can be found HERE and includes a link to the video. For more information about PDAC, please visit the subpage HERE. On Thursday, September 15th, 2016 the Parent Diversity Advisory Council (PDAC) held their first meeting of the year. This year’s theme is based on the book, Mindset. Discussions and relevant activities occurred based on the first chapter. Join us next time on Tuesday, November 15th, 7:00-9:00 pm, at CEC (780 Shoreline Drive in Aurora) for further Mindset development. To view the presentation from the meeting, calendar for the year or learn more about PDAC, please visit the PDAC subpage.